Visitors to the Czech Republic will often travel from the capital city of Prague on a daytrip to Kutnä Hora. About 73 kilometres to the southeast from Prague, Kutnä Hora is best known for the two churches which have given the city UNESCO World Heritage Site status, as well as the famous kostnice or “Bone Church” (Ossuary). In this post, I’ll illustrate some details of our return-trip by train from Prague to Kutnä Hora. Four friends and I set out to Kutnä Hora on a Saturday morning and returned Saturday afternoon. A very quick visit the trip might have been, but various reasons dictated an early return. Between train and bus, we chose the train to arrive in the “Sedlec” area of Kutnä Hora closest to the Bone Church. 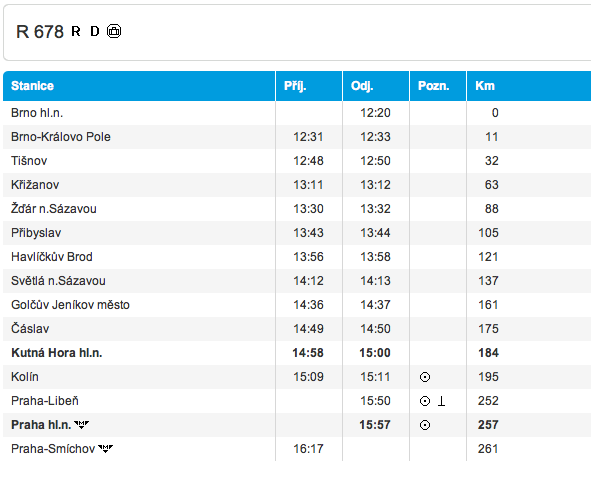 A day or two before departure, we searched the Czech Railways (České dráhy) website. Available in either Czech or English, the language choice is indicated at the top-right corner of their homepage. After searching for suitable trains, we decided to take the 959am fast regional R679 train service (one hour journey) to Kutná Hora, and the R678 train at 3pm for the one-hour service back to Prague. We also chose services which didn’t involve a stop or a change of trains. 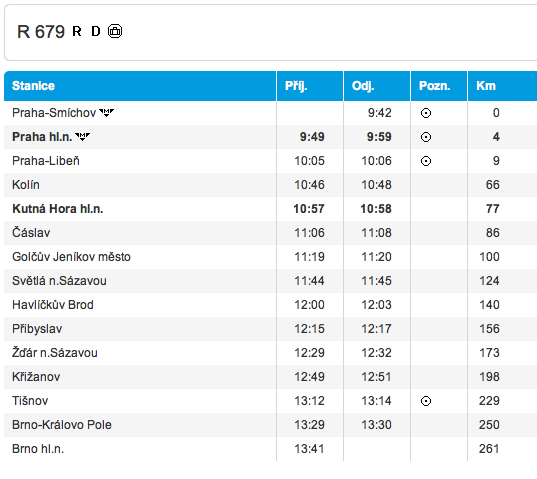 For our desired train routes, the following graphics represent portions of the search results from the Czech Railways webpage; “příjezd” and “odjezd” are “arrival” and “departure”, respectively. We arrived at Prague’s main train station Saturday morning about 45 minutes before departure, and walked up to the “Jízdenky” counters to purchase our fares. The adult full-fare for a one-way ticket was 104 CZK, but we received the “Group Discount” for our group of five. The following graphics show a brief description in English of the group discount ticket available to passengers on Czech Rail. 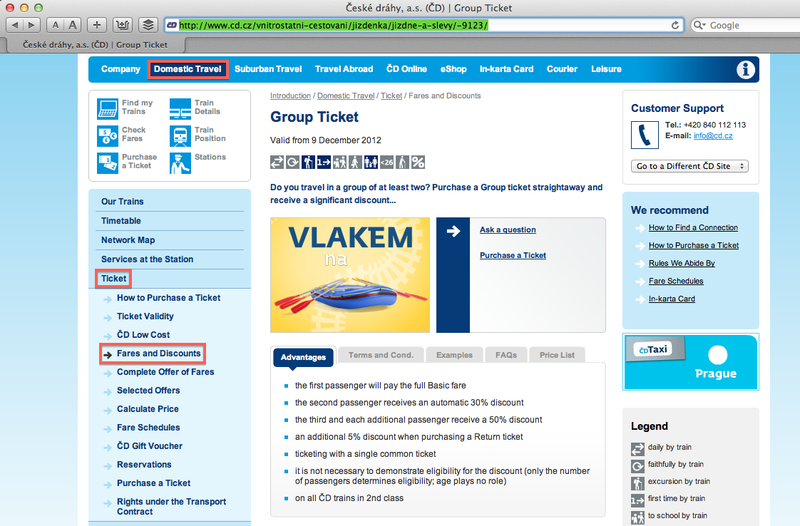 From the English version of the Czech Rail homepage, I selected “Domestic Travel” from the top menu, followed by “Ticket” and “Fares and Discounts” along the left sidebar. A drop-down menu appeared, and I selected “Group Ticket”. * 1st passenger at full-fare: 104 CZK (Czech crowns). * 2nd passenger at 30% discount: 73 CZK. * 3rd, 4th, and 5th passenger, at 50% discount: 52 CZK each. The entire one-way fare was 333 CZK, or 666 CZK for a full-return. For this short domestic trip, we didn’t spend extra for reserved seating. It’s worth noting we purchased a single group-ticket for five people, and not five individual tickets. Because we purchased the entire return fare as a group at the same time, we received an additional 5% discount for a total return-fare of 633 CZK, or about $32 USD. That’s a total of $32 USD among 5 people on a return-trip lasting 2 hours over a total distance of 146 kilometres (91 miles). We traveled on 3 August 2013; our search, fares, and choice of trains remained valid after my back-checking in late-August. * trams 5, 9, and 26, which stop just outside of the main train station. Fast regional trains from Prague stop at the Kutná Hora main train station in the Sedlec neighbourhood, located outside of the town centre. However, Sedlec is also where the Ossuary and the Assumption church are located, within walking distance from the main train station. The map below shows the locations of the main train station (T), Ossuary (O), Assumption church (A), and St. Barbara’s cathedral (B). I obtained screen captures after searching Czech Railway webpages in August 2013; I also made the Instagram images shown above on 3 August 2013. This post appears on Fotoeins Fotopress at fotoeins.com as http://wp.me/p1BIdT-3DX. Disclosure: No Connection, Unpaid, My Own Opinions. I have not received any compensation for writing this content and I have no material connection to the brands, topics and/or products that are mentioned herein. Thanks! Super helpful in regards to getting the train tickets and the group discount. Love it all! Glad my post was helpful and things worked out for you, Danielle: happy travels!